Fukudaya is a traditional soba-ya on a narrow pedestrian street in the love hotel area on the Shibuya backstreets. The clientele is smart, ranging from fashionable youth to elderly warmly welcomed as regulars. The soba is light and the serving size is generous. Just minutes from the station on the 2nd floor above a 7-11. The older waitstaff and the traditional interior has the feeling of being in shitamachi, the older part of Tokyo. 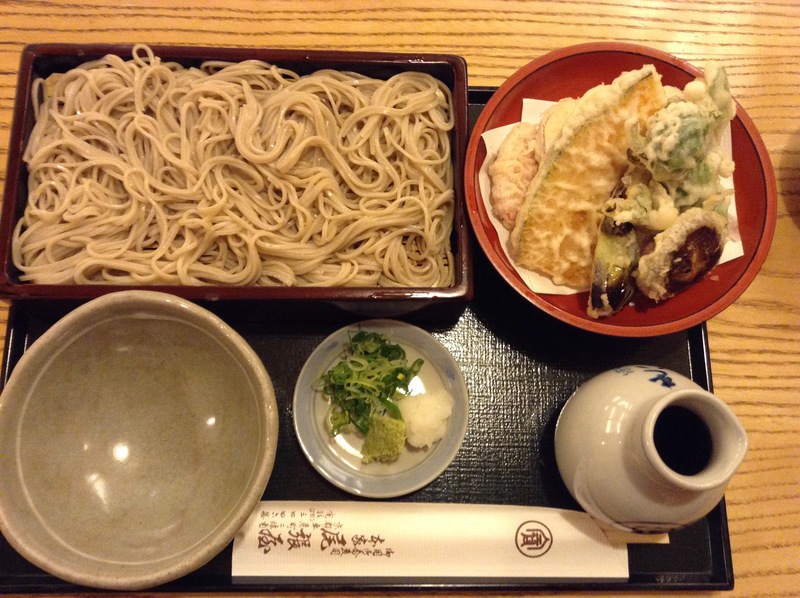 Photo: Tempura seiro soba – I had vegetables substituted for the shrimp. 1,300 JPY. Our last meal of each year in Japan is soba, buckwheat noodles. We call this toshi koshi soba (年越し蕎麦), literally crossing into the new year soba. At first I didn’t get the ritual. Why such a simple meal, either for dinner, or if you are up at midnight, as a small snack late at night? Shouldn’t we be having a big celebration or something more over the top like caviar and Champagne? But living in a Japanese household, I have seen how hectic and busy the end of December is, especially if you are making osechi ryori (お節料理), an elaborate bento that is to be eaten on January 1st. 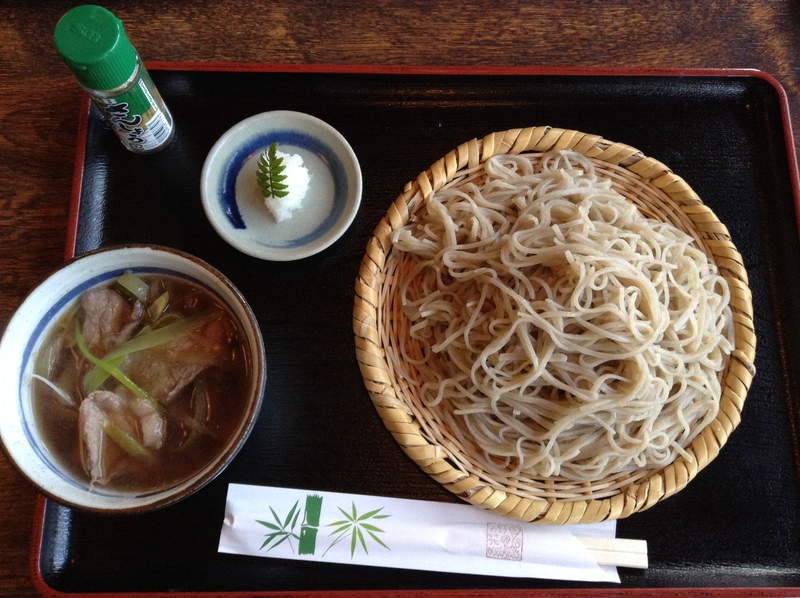 The simple meal of buckwheat noodles is a quiet respite from end of the year craziness. The tradition dates back to the Edo era. It is reported that more than half of all Japanese will eat soba on December 31st. Soba shops around the city are busy and historic shops will have long queues. Arigato, to our blog followers and clients from our Food Sake Tokyo tours. We are grateful for your friendship. We wish you all the best for the new year. The shop is just off of a main street and in a residential area. The menu is only in Japanese, so best to go with a Japanese friend, or have your hotel call ahead and arrange a menu. Takahashi has a nice selection of sake as well. Dassai from Yamaguchi is on the list. This day we went with Tefu from Kokken in Fukushima. It is made with Miyama-Nishiki rice and is unpasteurized. The junmai sake is soft and food-friendly, a lovely partner to soba. The shop brings out some deep-fried soba noodles with our sake. We started with goma-dōfu (sesame tofu), which was quite firm. The soba sashimi was cut into long strips and was a nice hint as to what was coming. 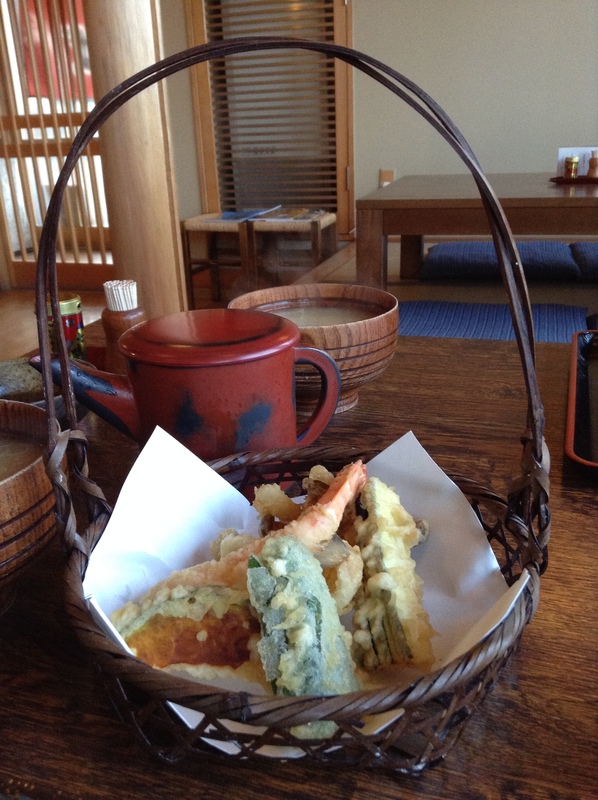 The tempura included both shrimp and vegetables. My friend was excited as fresh nori soba was on the menu. It was my first time to have it and it was lovely. A generous amount of soft nori that is reminiscent of the ocean is on top of the handmade soba. 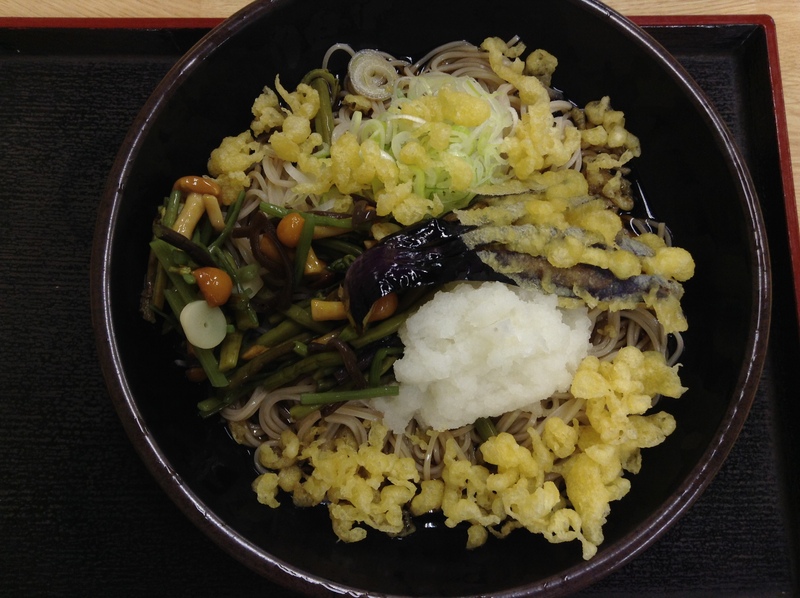 The nori soba was the seasonal soba. Can you imagine, nori having a season? It does, and it is just now ending its season, so get it while you can. Our table overlooked the soba processing room, but by lunchtime the master was done rolling and cutting the soba. Highly recommend Takahashi, but be sure to go with a Japanese speaker or arrange your menu ahead of time. The menu is only in Japanese and don’t expect any English here. I also love that it is a bit of a walk from the station as the other customers there obviously made the trek for Takahashi-san’s soba. closed Wednesday and the third Tuesday of each month. Owariya is a Kyoto soba shop with a rich history, that can be traced back hundreds of years. I love the branch in Takashimaya as it is near many popular sites such as Nishiki Market and Gion. As the shop is in a department store, it is also kid-friendly. The vegetable tempura soba (1620 JPY) included sansai, spring vegetables, and the dark red Kyoto carrot. 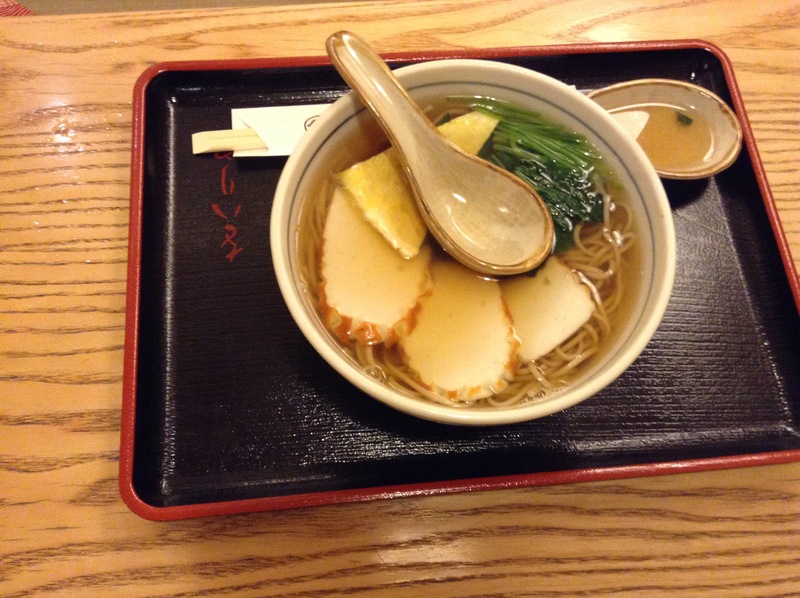 We ordered a kake soba (756 JPY), soba with hot broth, and topped it with fish cakes. Owariya is on the 7th floor of Takashimaya. If you like shōchū, you should definitely try the soba shochu served with soba-yū, the hot water that the soba is cooked in. Just minutes from Iidabashi stations (both JR and the Metro) is a lovely spot for handmade soba, Kuzuryu Soba. 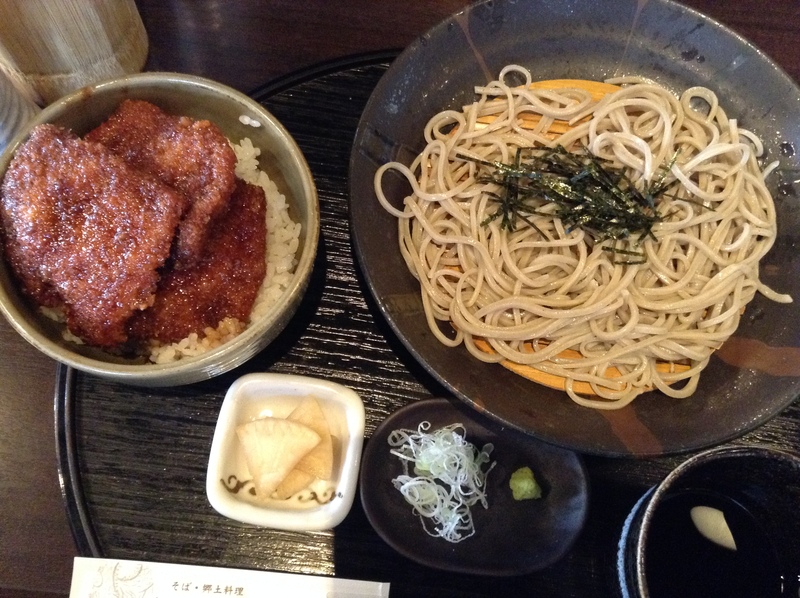 The lunch set includes both soba and a donburi, rice bowl. The donburi options include curry rice, oyakodon (chicken and soft-scrambled eggs), and their recommendation – sōsu katsu, thin-slices of pork deep-fried and then covered with just the right amount of a sweet and salty sauce. It is such a bold and umami-rich dish that it almost outshines what we came here for, the soba. 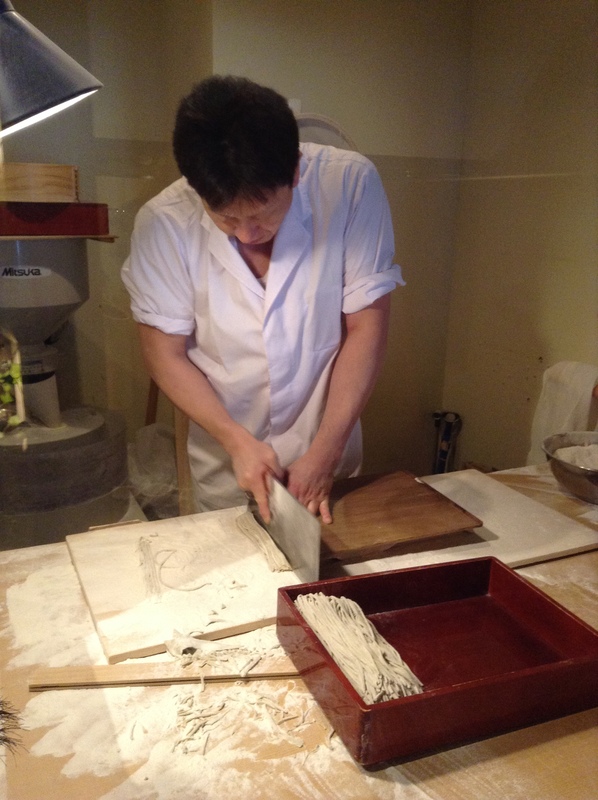 The buckwheat noodles are made from scratch in the store and if you are lucky you can watch the soba dough being sliced into thin noodles with the large, rectangular soba knife. The gorgeous dishware is on display. 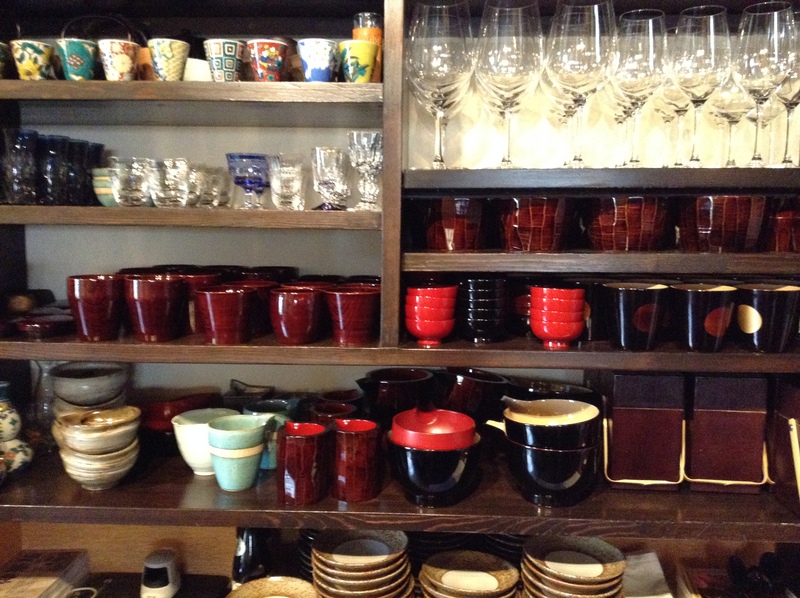 Lovely lacquer and colorful tableware that is a reminder of how dining in Japanese is done first with the eyes. Did I mention the price of the lunch? Only 890 JPY. Great bargain for handmade soba and donburi. My first introduction to Honmura An was in New York City back about 15 years ago. 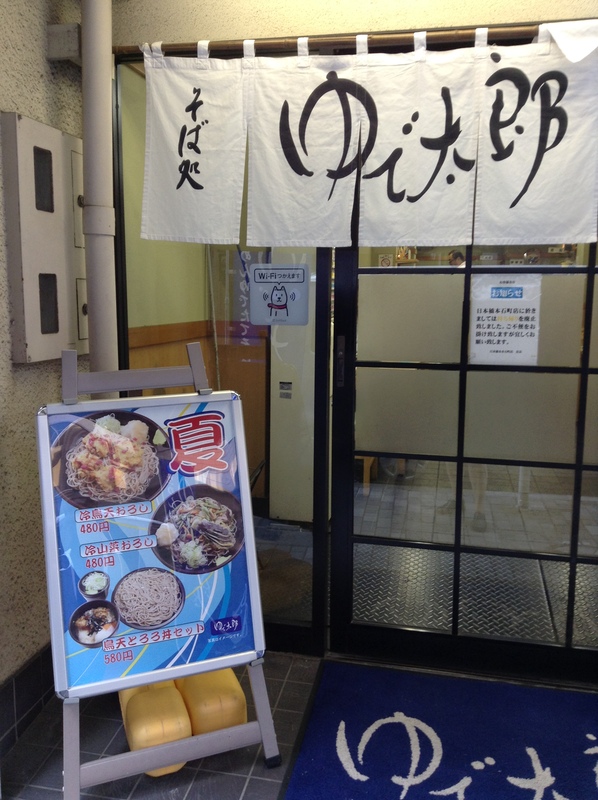 A friend who loved soba wanted to share with me his favorite soba shop in the city. I was mesmerized with the stone grinder for crushing the dried buckwheat and impressed that the noodles were being made fresh daily. Sadly the Manhattan shop has since closed. Honmura An has since relocated to Tokyo, in Roppongi, just across the street and around a corner from the massive Tokyo Midtown complex. It is a short walk from Roppongi Hills or any of the Roppongi stations. The interior is modern and sparsely decorated with simple washi, Japanese paper, that hangs from above. In the back of the restaurant there is a large window overlooking the soba prep room. Sadly when we arrived the rolling and cutting of the noodles were done for the first seating of lunch. A few tables had solo diners, in their 20s, plugged into their own music or engrossed into their phones and the outer world. Most of the diners were area businessmen and ladies who lunch. The restaurant has a big menu of small bites that can be had before finishing off with soba. At lunchtime most people were not having the side dishes but all going straight for the buckwheat noodles. This day it was quite hot outside and as one would expect, most diners were ordering the cold noodles. I had asked if they had yakimiso, a classic dish of a sweet miso, often studded with buckwheat, that is grilled. I was disappointed when I was told it wasn’t served so we ordered two types of soba. 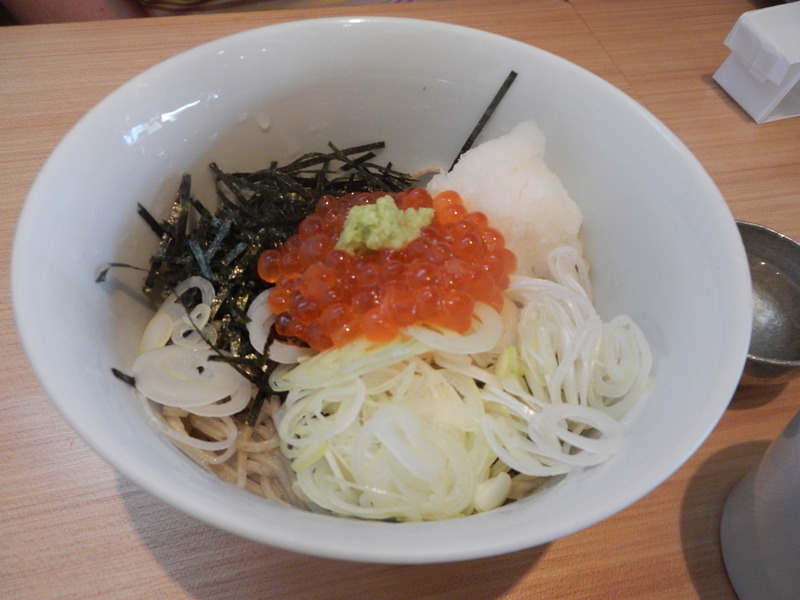 One topped with a creamy, fresh yuba (soy milk skin) and the other a grated daikon and ikura (marinated salmon roe). The noodles are fine and very delicate and this would be a great light lunch during the hot summers that Tokyo is known for. Honmura An has a nice selection of saké and wine. I was so happy to see Urakasumi Junmaishu on the list that I didn’t even bother looking at the wine list. The saké is easy on the palate and a nice partner to the soba.